The existence of oceans, seas or lakes is supported by a large variety of morphologic landforms, including ridges, wave-cut platforms and coastal cliffs (e.g., Parker et al., 1993; Head et al., 1999; Webb, 2004; Ghatan and Zimbelman, 2006; Erkeling et al, 2012) and associated delta deposits (e.g., Hauber et al., 2009; Di Achille and Hynek, 2010). Some of these morphologies appear along two global “paleoshorelines” that represent the two most continuous contacts on Mars and possibly reflect different water levels, i.e., the Arabia “shoreline” and the Deuteronilus “shoreline” (e.g., Parker et al., 1989, 1993; Head et al., 1999; Clifford and Parker, 2001; Carr and Head, 2003; Ghatan and Zimbelman, 2006). 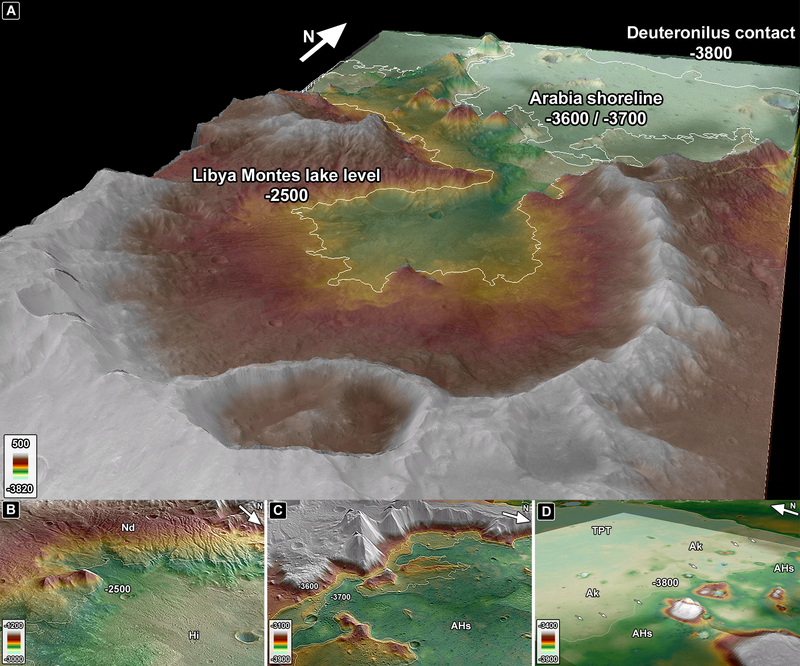 A series of morphologic landforms indicative of fluvial and lacustrine environments in the Libya Montes and seas in Isidis Planitia have been identified at three different elevation levels along the boundary between southern Isidis Planitia and the Libya Montes highlands (Image 1 a). In particular, (1) local occurrences of valleys and associated alluvial fans, a delta and an open-basin paleolake between -2500 and -2800 meters (Image 1b), (2) a series of possible coastal cliffs of the Arabia shoreline at -3600 and -3700 meters (Image 1c), and (3) the Deuteronilus shoreline contact as an onlap morphology, i.e. 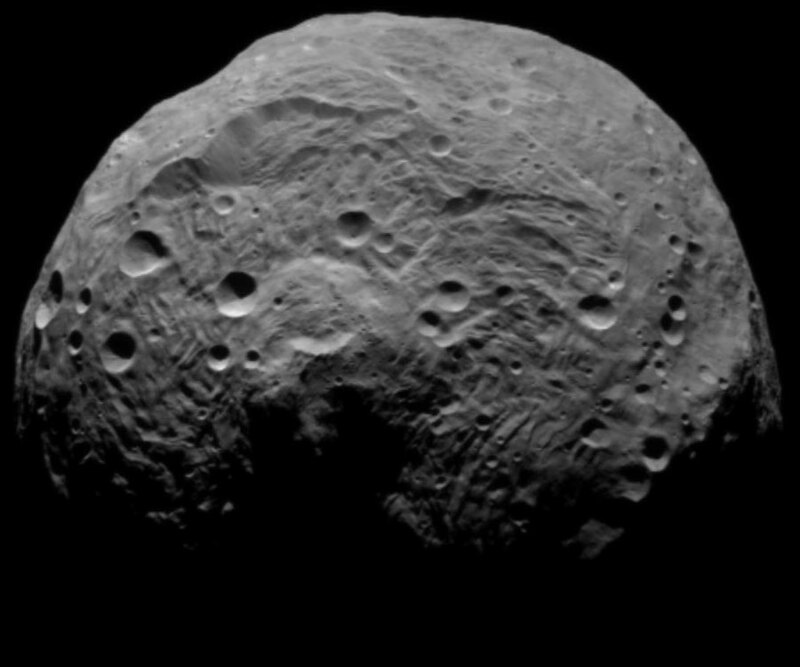 the Isidis interior plains are superposed onto the Isidis exterior plains (Image 1d). The geologic setting and chronostratigraphic sequence, that indicate Late Noachian landforms at the Libya / Isidis contact, Hesperian landforms at the Arabia shoreline and Early Amazonian landforms at the Deuteronilus contact, are consistent with the proposed Hesperian climate change from warm and wet to cold and dry conditions. Cabrol, N.A. and Grin, E.A., 1999. Distribution, Classification, and Ages of Martian Impact Crater Lakes. Icarus 142, 160-172, doi:10.1006/icar.1999.6191. Cabrol, N.A. and Grin, E.A., 2001. The evolution of lacustrine environments on Mars: Is Mars only hydrologically dormant? Icarus 149, 291-328, doi:10.1006/icar.2000.6530. Carr, M.H. and Head, J.W., 2003. Oceans on Mars: An assessment of the observational evidence and possible fate. J. Geophys. Res. 108, E5, doi: 10.1029/2002JE001963. Clifford, S.M. and Parker, T.J., 2001. The Evolution of the Martian Hydrosphere: Implications for the Fate of a Primordial Ocean and the Current State of the Northern Plains. Icarus 154, 40-79, doi:10.1006/icar.2001.6671. Di Achille, G. and Hynek, B.M., 2010. Ancient ocean on Mars supported by global distribution of deltas and valleys. Nature 3, 7, 459-463, doi:10.1038/ngeo891. Erkeling G., Reiss D. Hiesinger H. Poulet F., Carter J. 2012. Valleys, Paleolakes and Possible Shorelines at the Libya Montes / Isidis Boundary: Implications for the Hydrologic Evolution of Mars . Icarus 219: 393-413. doi: 10.1016/j.icarus.2012.03.012. Ghatan, G. and Zimbelman, J., 2006. Paucity of candidate coastal constructional landforms along proposed shorelines on Mars: Implications for a northern lowlands-filling ocean. Icarus 185, 171-196, doi:10.1016/j.icarus.2006.06.007. Head, J.W., Hiesinger, H., Ivanov, M.A., Kreslavsky, M.A., Pratt, S., Thomson, B.J., 1999. 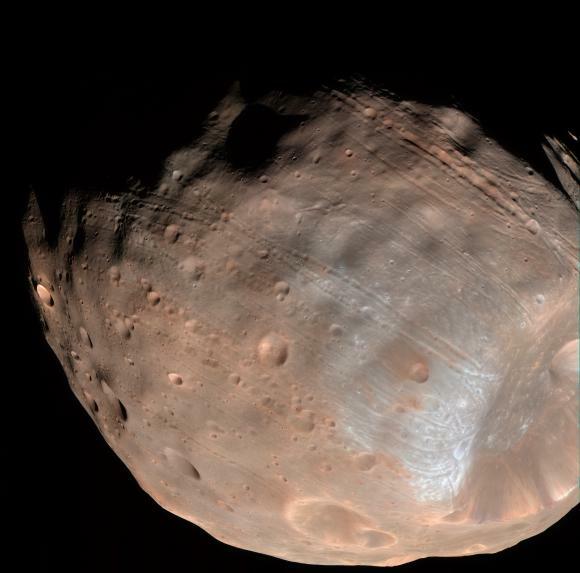 Possible Ancient Oceans on Mars: Evidence from Mars Orbiter Laser Altimeter Data. Science 286, 2134, doi:10.1126/science.286.5447.2134. Kreslavsky, M.A. and Head, J.W., 2002. Fate of outflow channel effluents in the northern lowlands of Mars: The Vastitas Borealis Formation as a sublimation residue from frozen ponded bodies of water. J. Geophys. Res. 107, E12, 5121, doi:10.1029/2001JE001831. Mouginot, J., Pommerol, A., Beck, P., Kofman, W., Clifford, S.M., 2012. 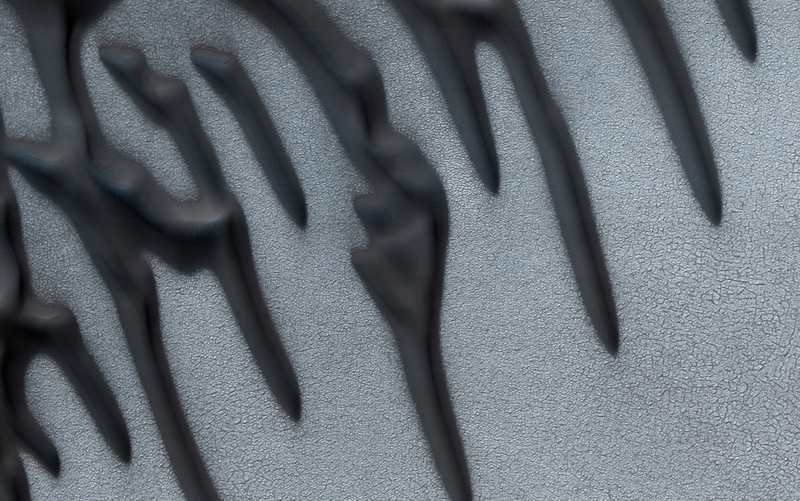 Dielectric map of the Martian northern hemisphere and the nature of plain filling materials. Geophys. Res. Lett. 39, L02202, doi:10.1029/2011GL050286. Parker, T.J., Saunders, R.S., Schneeberger, D.M., 1989. Transitional Morphology in West Deuteronilus Mensae, Mars: Implications for Modification of the Lowland/Upland Boundary. Icarus 82, 111-145, doi:10.1016/0019-1035(89)90027-4. Parker, T.J., Gorsline, D.S., Saunders, R.S., Pieri, D.C., Schneeberger, D.M., 1993. Coastal geomorphology of the Martian northern plains. J. Geophys. Res. 98, E6, 11,061-11,078, doi:10.1029/93JE00618.